See a ready-printed sample pack of labels before you order a larger custom run. See the various sizes we offer printed on woven satin label material. Font size tips, full-colour print, and formats like loop fold or straight cut, will give you a good idea of how fabric labels for handmade items come out. Order your Fabric Label Sample Set and get a £5 gift voucher to use on your next order of custom labels. This includes fabric and non-fabric labels. Offer exclusive to new customers only and can only be used once. Voucher expires after 30 days. 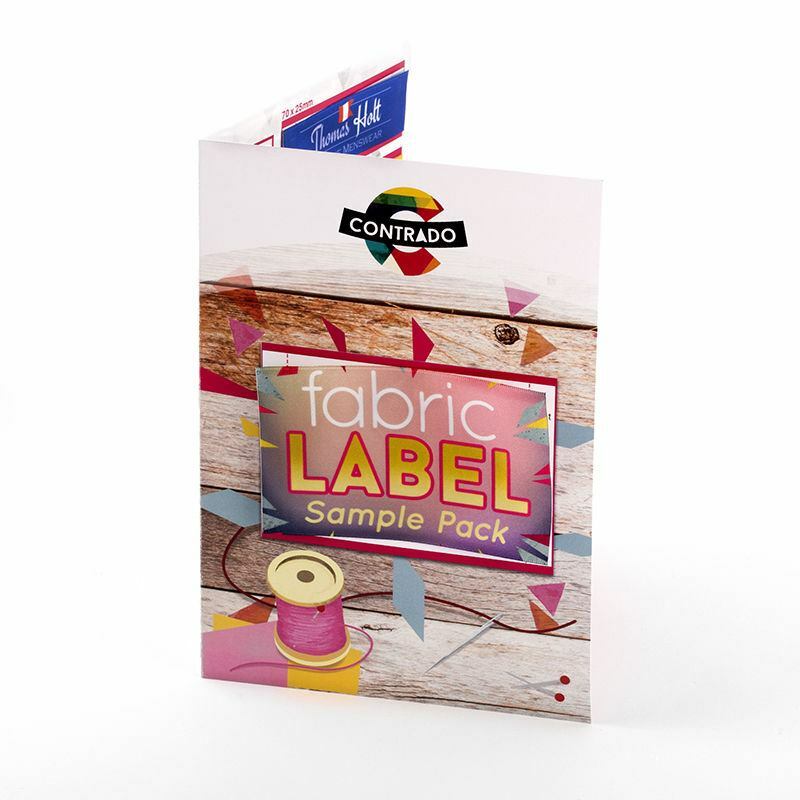 Sample pack includes tips, a variety of sizes and various other options that you will have when you create your own fabric labels. You guys are so fast! 3 days from England to Canada. The sample packs were thorough and I refer to it all the time. Try our samples of fabric labels so you can get the idea before ordering a larger quantity for your handmade items. Other label offerings are expensive, with narrow choice, minimal colour options, and have high quantity requirements, but we help you test the idea of labels with minimal outlay. Our printed finished labels are not expensive and start at 20 single labels, making it a cost-effective way for you to try custom printed labels. If you prefer, then go straight for our short run fabric labels order system where you can design them in full colour, with text. Either way, you get your labels in a few days. Our printed labels service is ideal for makers and sewing bees for professional look own brand labels. Launch a business with us with hardly any expense, starting with this handy sample set. We print a standardised run of each of our different types of fabric labels. We use a printing technique which gives excellent print quality and a durable, long lasting design. Our labels are made from a tightly woven soft satin, and this sample pack is printed with a full colour pre-set design. These display both flat and folded labels in a variety of sizes. 13 different labels to choose from, all supplied in a handy presentation pack.